A lady who loves makeup. A lady who is classic in her 50s who behaves like she 30. I’ve discovered that my illustrator is now on Myspace and he is actively promoting “Why is He Different?” This is exciting for me. Why? Word is getting out. Someone has inquired about bulk purchasing, another person would like some books for a raffle for a Biker ride for Autism, where she would mention the book and where to purchase during television and radio interviews. Also, I have made influential friends there who are also promoting the book. Hopefully soon, I will be able to do a book signing or two. I so hold this book near and dear to my heart. It has really made a difference in some people’s lives since it deals with the very serious and very real autism and the learning disbility of ADHD. It’s geared towards younger readers. Kyle is a 1st grader and can sometimes act very peculiar. It’s not his fault that he is on the autism spectrum and has ADHD but the kids in his classroom can’t understand. So his teacher and his best friend relate his story and make the other kids understand Kyle’s disabilities. 50% of all sales go to “Autism Speaks”. Have you ever encountered a child who acts differently, such as being bossy, screaming, disrespecting his parents, and asked yourself, why does this child behave like this? Is it uninformed parenting or something else altogether? Why Is He Different is about a young boy in the 1st grade named Kyle who suffers from ADHD. Kyle’s unique qualities endear him to his classmates at times, and disturb them at others. The story is told through the eyes of his best friend, a compassionate young boy who despite knowing Kyle’s differences befriends him. This book was inspired by Linda Fox, the mother of a boy whose life is very similar to that of the child in this story. Mrs. Fox’s son endured much of the same misunderstandings and teasing that many children do who are diagnosed with conditions within the Autism Spectrum. The story’s purpose is to bring about awareness and provide a forum that will open up discussions and promote tolerance and acceptance of these children whose disabilities may not be understood by school-age children. My name is Linda and I am a 42 year old mom of two little boys. I have always enjoyed writing, but it really took off last year when I discovered Nanowrimo. I failed in my quest, but in the last year have published 3 books. The first one is an anthology of poetry called Internally Love Shines. It is a collection of work that I wrote some 15 years ago. I was lonely and I had just lost my grandmother. I then wrote “Big Brother, Little Brother which is based on my two sons. My pride and joy though has got to be “Why is He Different”. This project was from my heart. My oldest son has ADHD and is on the Autism Spectrum. 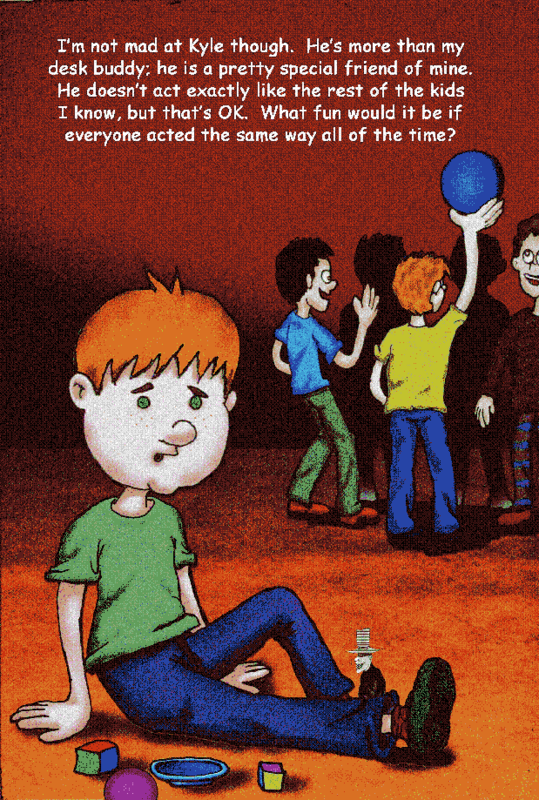 It broke my heart when the kids at his school would sometimes tease him, so I wrote this book so that other children would learn acceptance of other kids no matter how different they are.